So, how is your heart doing? Well, she didn’t say. She just told me to take off my shirt, turned off the light, put some goop on my chest and prodded me with her magic wand and we watched my heart on the computer together. That was it. So an echocardiogram is like an ultrasound? It’s exactly like an ultrasound. But instead of seeing tiny hands and feet, you see this gray image of a pure muscle palpitating. You can hear its sound too. And it sounds like a swamp toad. Not graceful at all. So when are you gonna know if your heart is okay? I don’t know. She will give the test result to my doctor and he will call me by the end of the week, maybe. Why did you have to get an echo in the first place? What’s wrong with your heart? The blood wasn’t pumping through your body. Correct. The blood wasn’t sufficiently circulating through my body. I couldn’t really run. I walk, say, from here to over there to the door, I had to take a break. I had purple lips and fingernails. But now you are all better. Well, because I had a heart transplant. I have a baboon’s heart. Yeah. They gave me a baboon’s heart. They didn’t fix your heart? They replaced it with a baboon’s? No, they didn’t fix it. Apparently baboon’s is the closest to human’s they say. Did they give your heart back? You know like in a jar, like when they take your tonsils out? No, I wish. They probably threw it in a garbage can or fed it to the dogs. No. I didn’t get my heart back in a jar. Well, now I got incredibly warm hands and feet and I sweat a lot. Thanks to my baboon heart. Because it beats faster than human’s. Is that why you are always hyper? I detected a real concern in her voice. I couldn't lie anymore. 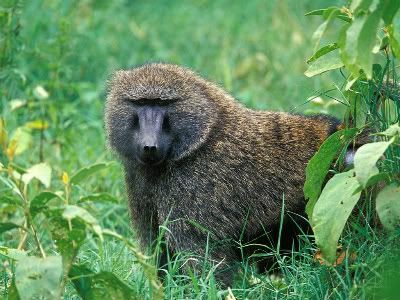 Baboons are not graceful either. Awwwwwwww although I feel really stupid because you based this off our conversation, I'm also flattered to be worthy of a story!